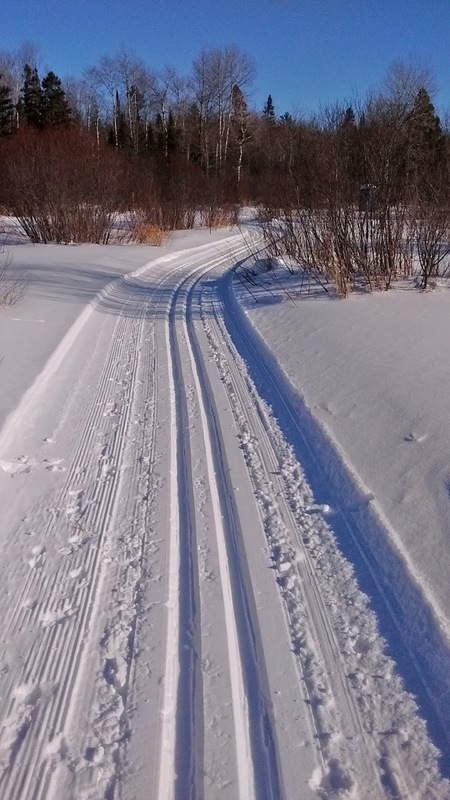 Two perfect tracks paralleled a sinuous curve of the frozen Montreal River. Back at the ABR ski trails near Ironwood, MI, I was enjoying a leisurely classic ski while my friends all zipped around the wider trails on their skate skis. The morning was perfect: blue skies, bright sun, and temperatures rising quickly out of the teens. Here and there, a few animal tracks stitched their way across the trail. They were coyote, maybe, or red fox. Then a bigger depression beside the trail caught my eye. Was that a sitzmark from a clumsy skier? Not quite. 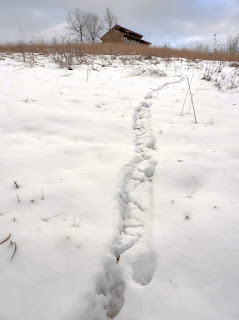 Like an upside down exclamation point, a yard-long, foot-wide trough ended at a small bridge of unbroken snow. 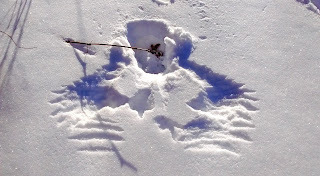 Capping it off was a chicken-sized snow angel. Naturally, I slid to a halt and gingerly backed up in the tracks to get a better look. I also pulled out my phone and turned on the camera. (I’d rather use a good camera, but I prefer to carry my phone!) 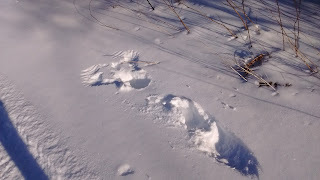 This was the best example of a ruffed grouse’s snow roost that I’d ever seen! 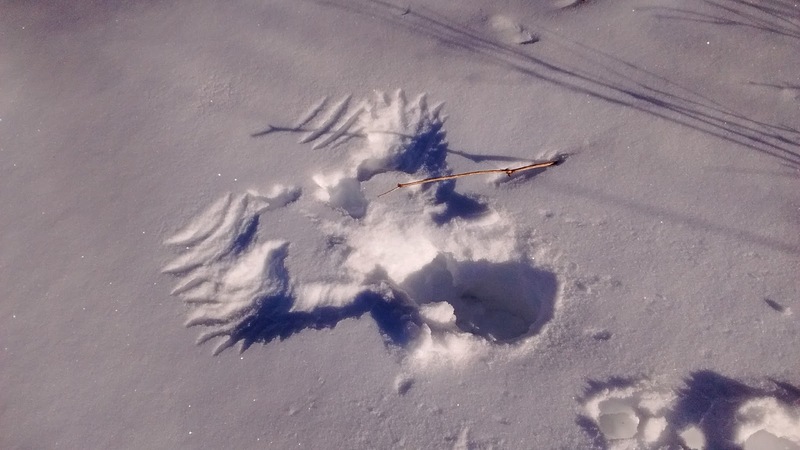 Grouse are exquisitely adapted to winter. They grow their own snowshoes in the form of fingernail-like projections on their sides of their toes. Extra feathers on their beak and legs provide insulation where it’s needed. And when their fluffy body feathers aren’t enough, grouse use the snow like it’s a cozy down comforter. 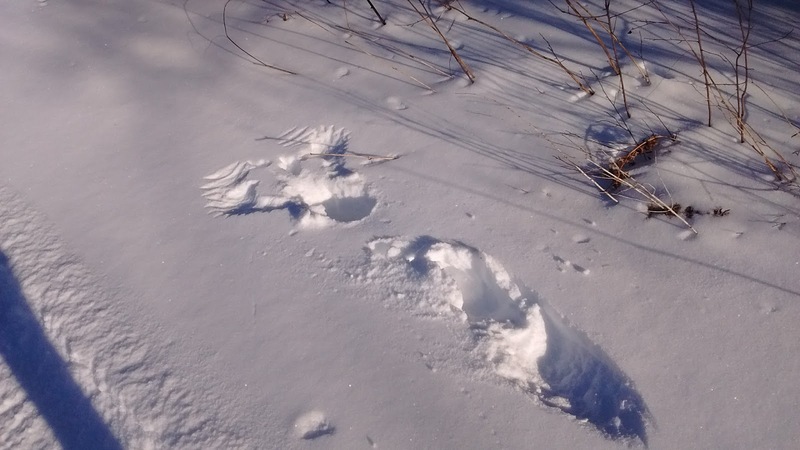 Once there are 10 or more inches of snow on the ground, grouse will dive or burrow into the fluff and spend the night in an air-filled tunnel. Temperatures under the insulating snowpack often reach a pleasant 32 degrees F. No matter how cold it gets, the snow roost rarely drops below 20 degrees F. Research has shown that grouse don’t need to really speed up their metabolism to keep warm until the temps dip below 25, so the snow roost provides them with significant energy savings. I could see the grouse’s sleeping nook begin where the trough ended. Skiing forward and looking back into the tunnel, I spotted a pile of about a dozen macaroni-shaped scats in the shadows. Yes, I took a picture of the scats! They represent another purpose for the snow roost. In winter, grouse subsist on tree buds and catkins. Trembling aspen buds seems to be the most nutritious—and grouse prefer them—but the buds and catkins of bigtooth aspen, birch, alder, willow, hazel, and ironwood also provide sugar and protein. There are two main problems with eating tree buds, though. First, they take a lot work to digest. To address this problem, grouse have a muscular gizzard with added grit that grinds up the woody material. From there, the softer materials enter the caeca. These two extra-long pouches contain specialized bacteria that can digest cellulose and absorb more nutrients before the food exits their digestive system. Waste from the caeca ends up as a dark, shapeless plop, while the woody materials become cylinders of molded sawdust like those I found in the roost. The second problem is that eating buds in the leafless treetops exposes you to the hungry eyes of predators. As many of you know, grouse meat is quite tasty. A grouse’s solution is to eat an entire day or night’s worth of food in about 20 minutes. They store all that food in their crop—an expandable sack at the base of their neck—and then find a safe spot to digest their meal. A snow roost shields grouse from the piercing eyesight of hawks and owls, as well as the sharp noses of foxes, coyotes, bobcats and fishers. With only my lowly human senses and tendency to daydream, I’m sure the snow roost would have completely concealed its resident from me. If I’d skied by earlier and been the one to flush out this grouse, I would have been completely astonished by the flying snow and flapping wings. 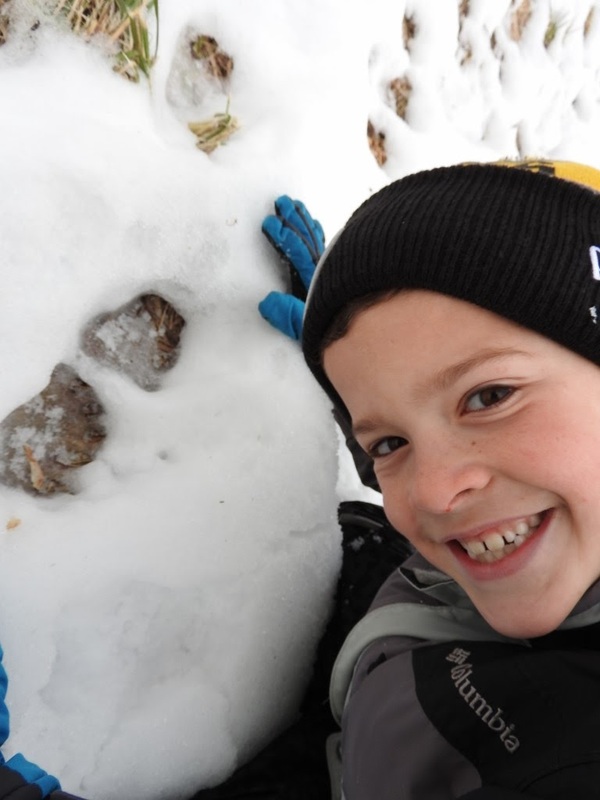 Snow roosts aren’t just an interesting tracking story to read in the snow, though. They are truly a necessity for these birds’ ability to survive the winter. Thin or crusty snow—unsuitable for roosts—makes their brown feathers more visible than no snow at all. While the deep freeze of last week may have challenged our thickest mittens, it also provided perfect conditions for grouse to hide. The balmy temperatures of this week may feel pleasant on bare skin, but they are wrecking the snow for grouse and skiers alike. A 2008 study in The Wilson Journal of Ornithology found that about 17% of the variation in grouse populations is controlled by snow conditions of the previous winter. 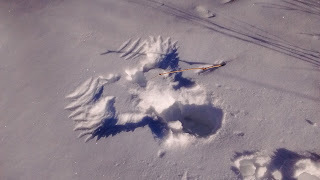 Deep, fluffy snow equals more grouse. Crusty snow results in a higher mortality rate. As I skied on (and on, and on…for a total of 50k of Birkie training in two days!) the tracks of weasels, hares, mice, wolves, deer, and squirrels crisscrossed the groomed trails. Just like the grouse—and the dozens of other skiers out on the trails—they have adapted to winter. If you know how to take advantage of it, good snow can be a real boost to your survival. Special Note: Emily's book, Natural Connections: Exploring Northwoods Nature through Science and Your Senses is here! Order your copy at http://cablemuseum.org/natural-connections-book/. Listen to the podcast at www.cablemusum.org! For 50 years, the Cable Natural History Museum has served to connect you to the Northwoods. Come visit us in Cable, WI! Our new phenology exhibit: "Nature's Calendar: Signs of the Seasons" is open through March 11. As the Cable Natural History Museum enters its fiftieth year in existence, we find ourselves pausing to remember the past as well as dream for the future. In particular, I find pleasure in contemplating the legacy of Lois Nestel, the founding naturalist, director, and curator of the Cable Natural History Museum. Lois was a talented, self-taught naturalist, artist, and taxidermist. Examples of her accomplishments populate every corner of our modern museum building. Her legacy is strong in the work that we do. I never met Lois, but every Friday I feel a particular kinship with her as I send my “Natural Connections” article off to the newspapers. Lois initiated the tradition of a weekly nature column provided by the Museum, and did so with a gentle, reverent, poetic style. Her column was titled “Wayside Wanderings,” and the articles were compiled into two small volumes in 1975. “The light covering of snow was pierced by winter ferns, ground pine, and club mosses that were unbelievably green by contrast, and where the evergreens were thick the duff was richly brown. How lucky we are that Lois wrote down these accounts of her wayside wanderings, so that the timeless images can live in our minds, too. Lois accomplished many great things over the years, but perhaps one of the most valuable is her ability to bring us into the woods with her. May the peace of her forest walk stay with you throughout your day. For 50 years, the Cable Natural History Museum has served to connect you to the Northwoods. Come visit us in Cable, WI! Our new phenology exhibit: “Nature’s Calendar: Signs of the Seasons” is open through March 11. The torrential rain on Christmas Day was really a bummer. At my parents’ house in northeast Iowa, we had thunder and ice as well. Once we’d finished Christmas dinner and started opening gifts, though, the weather outside no longer mattered. As the semi-solid drops beat against the garage doors, we drowned it out with the tapping of a hammer on geodes. The day after Christmas brought better weather, and three kids (well, four if you count me,) high on sugar cookies who needed an outlet for their energy. On went the boots, snow pants, jackets, mittens, and hats. Out came the rainbow of sleds and one snowboard. Surprisingly, the snow was perfect. Just a thin layer of icy granules blanketed the paths Papa had mowed through the prairie, but that was enough. The sledding hill required no packing, no snowplowing through deep fluff to create a run, and no spray of loose flakes flew up in your face or down your neck. Walking up the hill was a breeze, too, without post-holing on every step. After a few runs down the old fence line, parallel to a crumbling sentry line of dead elms, we switched to a path cut diagonally across the hill. I loved it. For some reason, I could maintain a straighter line on the side slope, and a sharp drop at the end provided just the right amount of added excitement. Also, I’ve always maintained that sledding is more fun when you yell. Hiking back up brought even more excitement. There, in the middle of the mowed path, just below the house, was a line of large, 5-toed tracks. I had Zac (age 7) put his gloved hand in one: perfect fit. Obviously the snow wasn't on a wall, but I can't get the program to allow this photo to upload horizontally! Had I been in Wisconsin or Minnesota, my first thought would have been fisher. Animals in the dog and cat families have four toes. Weasels, bears, and raccoons have five. But that large weasel doesn’t live in Iowa. As I followed the trail of the 5-toed animal looking for more clues, I came upon a well-preserved pair of tracks—the first one short and roundish, the second one elongated like a child’s foot. I stared in disbelief and shook my head. Bear? Bear! In Iowa? It’s actually not out of the question. Although Iowa is part of bears’ historic range, like many species, they were pushed out as the land became more settled. 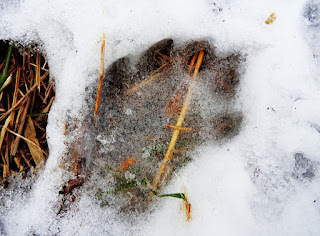 Just last June, though, my friend Brian Gibbs spotted one about 30 minutes from our sledding hill, and the Iowa DNR confirms about five black bear sightings a year. The working hypothesis is that as populations in nearby Minnesota and Wisconsin grow, antsy young males travel farther in search of food and females. I like the idea of my new Wisconsin home providing species to my old Iowa home. I wasn’t sure how the kids would react, but I had to tell them. “I think these are bear tracks, guys!” I said, and we all admired the tracks for about two seconds. Then the sledding resumed, and soon the perfect tracks were obliterated. Oh well. After sledding, Zac and I found Papa in his workshop and announced our discovery. We went out for a second look. 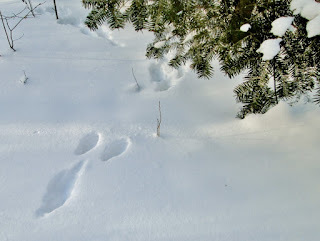 The three of us picked up the 5-toed tracks at the bottom of the hill, and started following their trail. All the tracks seemed shorter now, like the bear had four front feet. The trail wasn’t very wide, either—not like a broad-chested bruin. And then, across a straightaway, the messy trail resolved into a neat, two-by-two bounding pattern leading away from a trough pressed into the snow on the hillside. The bounding is classic in the weasel family. The trough clinched it: otter. In winter, their favorite gait is run-run-run-sliiiiiiide, and I couldn’t help but smile at the fact that this otter also was sledding down our hill. While otters, like bears, were extirpated from Iowa, otter reintroduction efforts began in 1985. Live-trapped wild turkeys were shipped from Iowa to Kentucky to help its restoration program. Kentucky sent cash to Louisiana, and Louisiana shipped otters to Iowa. In total, 345 otter were released in Iowa between 1985 and 2005. Today, the population is stable enough for a limited fur harvest. Overland travel is not out of the ordinary for otters as they navigate between watersheds. They can travel up to 26 miles in a day, with 5-6 miles being average. Females and their young stay together in family groups, and males will form their own groups, too. We followed the tracks back up the hill, across the road, through the end of the orchard, and to the edge of a briar patch on the bluff above the Turkey River. We stopped there, confident now that there were actually two otters, and that they were headed to the river for a fishy snack. Mystery solved, tired and warm from sledding and our hike, we headed away from the river, looking forward to a non-fishy snack. What did you have on your list when you climbed onto Santa’s lap this year? If you were one of my brother’s kids, you asked for rocks. “Anything else?” Santa pressed on. Rocks and dirt. Kids after my own heart! We are the Stone Family after all. While Santa may not have delivered, Auntie Em and Grandma did! The dirt is a relatively new request. Derek, 12, has been honing his gold panning skills, and wanted a new batch of Pay Dirt—complete with flakes of real gold—to pick through. The rocks are a different type of treasure. Somewhere along the line we introduced the kids to “crack your own geodes.” These bland-colored, roundish rocks look positively dumpy on the outside. Whack them with a hammer, though, and they split open to reveal an airy chamber lined with sparkling crystals. What’s not to love about a tradition that includes hitting and breaking things, the joy of surprise, and sparkles all in one? This year I wasn’t expecting much. The geodes I purchased at our Museum Shop were sallow, plain, and small. I was worried they’d be duds. Derek wasn’t discouraged, however; in his experience, these boring-looking ones have produced the best crystals. 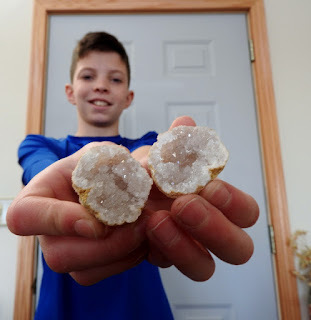 I brought four geodes, hoping that Isaac, 14, our original geode cracker, would put down his smart phone long enough to break his own. No such luck. He’s now a power tool addict waiting for the day when he owns a diamond saw and a way to hold the rocks for slicing. When that happens, watch out! Every rock in their extensive collection will be sliced open, anticipating the discovery of some spectacular inner beauty. The three younger kids and I put on shoes and safety glasses and headed into the garage. We rummaged on Papa’s work bench until we found a hammer and chisel, and let the cracking commence. Derek is the lead rock hound now, and he cracked the first one. It popped open easily, revealing a delicate lining of clear, glittering, crystals. “Ohhh and Ahhh,” we exclaimed appropriately. He also cracked Isaac’s geode, and the kids dutifully set it aside for their big brother after admiring the sparkles. Next, Zac, 7, the rock cracker’s apprentice, took his turn. The geode rolled around a bit under his tentative hammer, and Derek bravely helped him out by holding it steady. His fingers survived! A crack formed, and one more gentle tap split it open to an admiring chorus. Somehow, the anticipation and revelation never gets old. After Derek helped Zac’s twin, Kylee, split hers, too, they all trouped back inside to show Grandma. 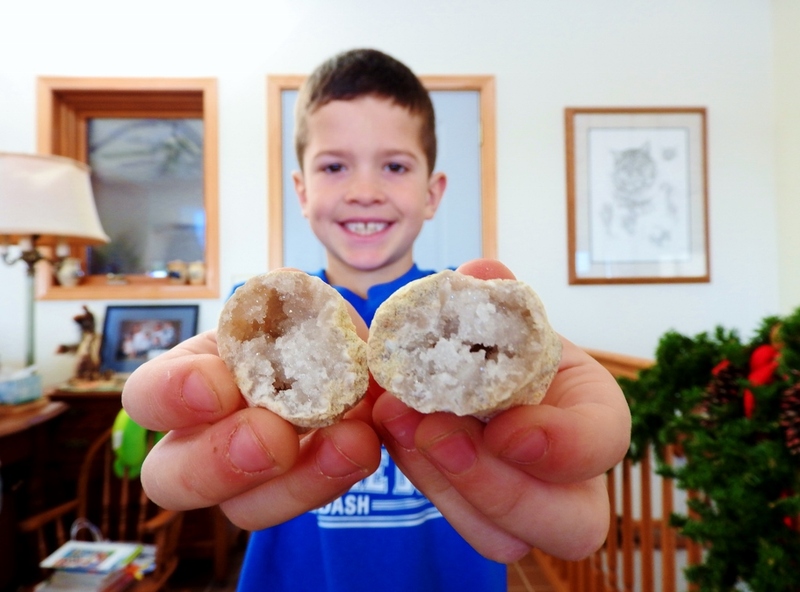 Derek’s prediction had been correct: these unassuming geodes all held beautiful crystals, and the kids declared this the best round of Christmas geodes yet! Curious as to where these splendid geodes came from, I looked up the purchase order. “Moroccan geodes” was their exotic title. This little country at the northern edge of Africa hasn’t seen a glacier in ages, so the rocks there have had time to weather at the surface. The region boasts some cool geology. 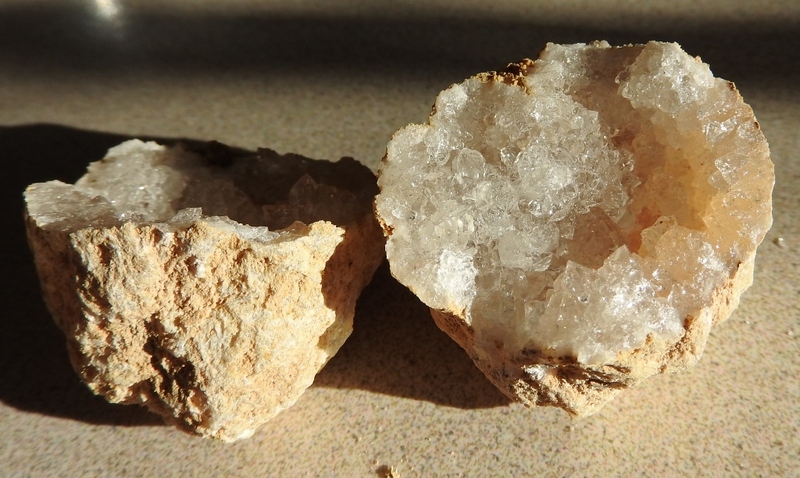 Morocco’s geodes were formed in basalt—just like our Lake Superior agates. But the photos of Moroccan basalt look nothing like the glacier-polished North Shore. The African rock is crumbly and brown from ages of oxidation and weathering. Geodes occur closer to home, too. They are the state rock of Iowa! The epicenter of Iowa geodes is in the far southeastern corner, in a 35-mile radius around the town of Keokuk, including parts of Missouri and Illinois. This world-renowned site sits on the lower Warsaw Formation, which was deposited as mud in a shallow sea 340 million years ago, and lithified into shales and limestones. It doesn’t matter if geodes form in basalt or limestone; they still need a cavity to start with. The holes in basalt were created when gas bubbles formed in the cooling lava. The holes in the Iowa limestone have a more complicated origin. They began as concretions, which are the opposite of geodes. Concretions formed when minerals hardened around some nucleus in the mud, creating a nodule. After the chemical composition and acidity of the surrounding water changed, a cryptocrystalline type of quartz replaced their outer shell. Next, the inner, more soluble minerals of the concretions dissolved and left a hollow space. Finally, over thousands to millions of years, mineral-rich groundwater percolated through the space and precipitated sharp-angled crystals of quartz from the walls of the cavity inward. Sometimes other minerals will join the mix and expand the color palette. As in agates, these colors occasionally form concentric bands. The difference between agates and geodes is that agates are created when cavities in the rocks are filled with patterns of colorful cryptocrystalline quartz, while geodes grow visible crystals (not always quartz) into a hollow center. 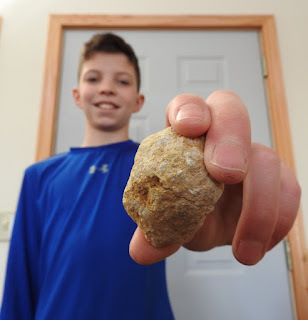 In any case, getting rocks in your Christmas stocking can be a pretty fun tradition. With the Stone kids, I think that even a shiny black lump of coal would be a treat!